Asha survived BeiTech’s initial assault and has been working undercover with the hopelessly outmatched resistance ever since. That, and figuring out what to do with the secret she’s stashed in the crawlspace. The last thing she expected to worry about was her ex-boyfriend, but Rhys Lindstrom just landed planetside, and he’s looking finer than ever in his new BeiTech uniform. Is he her way out - or a guarantee she never gets off this frozen rock alive? But Asha’s not the only one with problems. Her cousin Kady’s ragtag band of survivors are headed for Kerenza - without enough oxygen to last the journey. Oh, and there might be an insurrection brewing. But when have little things like that ever stopped the Illuminae Group? I promise there are no spoilers in this review, but there is my unveiled joy at reading the final of the Illuminae series. Before we begin, we already know Jay Kristoff and Amie Kaufman are brilliant writers, and have created masterpieces that defy description with their innovative use of text and image. Reading their work is a wild ride. Kady, Ezra, Hanna, and Nik have escaped from the attacks on Heimdall station and now find themselves essentially in a refugee camp. Are the authors making parallels to the atrocities happening in the world right now? Who knows? Maybe? The characters know they need to return to Kerenza where Kady’s cousin, Asha, and Rhys remain. There are battles and complete terror as together and apart they try to save the end game. Old relationships also start again, but all is not as it seems. This finale is a real pageturner. It was such an enjoyable read that one would have to re-read it to fully enjoy and revel in it. So please don’t judge me too harshly for my first read of it. 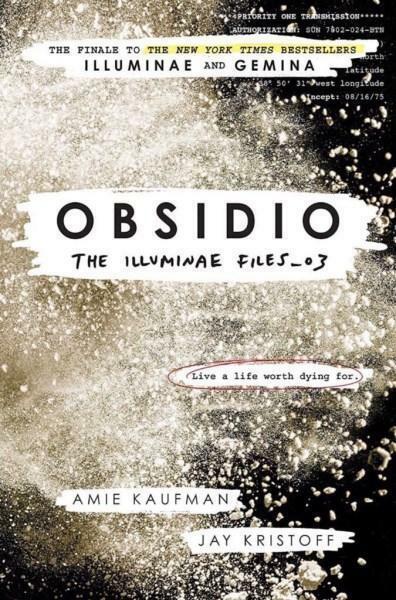 Do you need to have read the other two novels in the series for Obsidio to make sense? No, but you should read them! It is a series, after all, and the other books are an absolute treat. Kristoff and Kaufman will hold your hand all the way to the end of this entertaining and thoughtful romp through the great expanse of space-adventure. Andras Kerekes works as a bookseller at Readings Kids.